If you’ve never traveled to and witnessed Florida’s Big Bend area, then you’ve been missing out. Some affectionately refer to this area as “Old Florida”. 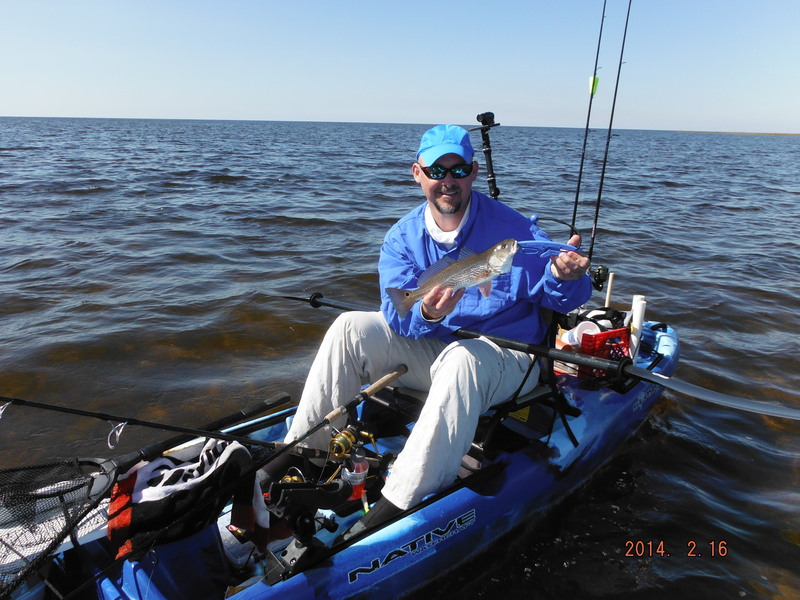 While there isn’t much in the way of amenities, it’s a fishing paradise with miles of flats and crystal clear waters. It had been some time since I’d made the trip to the Steinhatchee area, mainly due to it’s being a 3hr trip each way from my home in Jacksonville, but decided that it’d been way too long. Fellow Yak Outlaw Buddy and I decided we were both long overdue, and scheduled a trip. Forecasts were perfect for a day at the ‘Hatch, with clear blue skies, calm winds, and perfect temps. 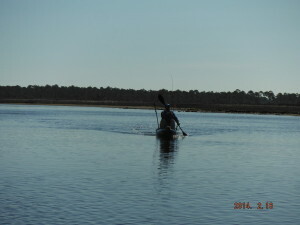 We’d decided to launch from Rocky Creek and made the short paddle out onto the flats. 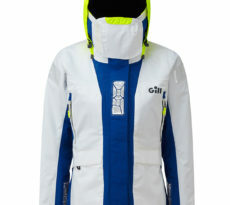 We arrived at the launch with the weather forecast holding true, and quickly got to work unloading our gear. 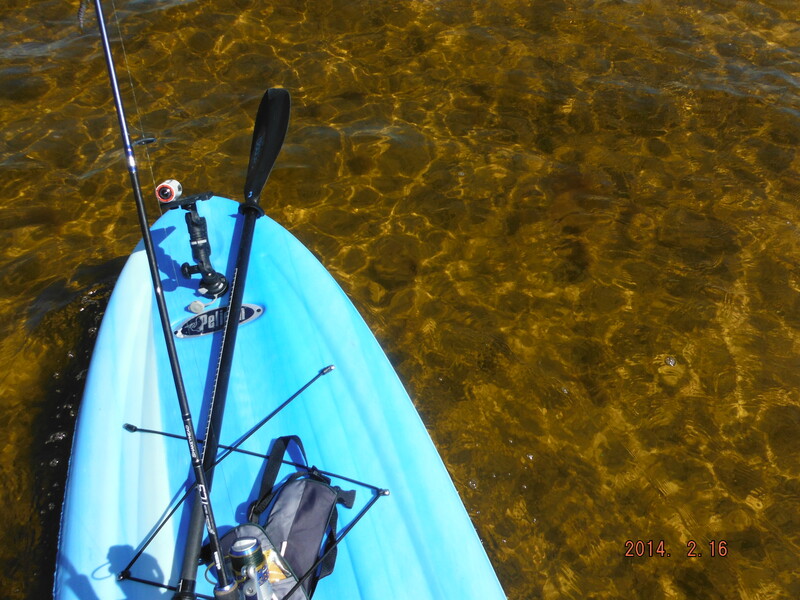 For this trip, I’d decided to fish off my Pelican Flow 116 Stand Up Paddleboard. 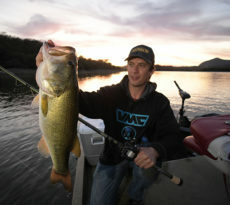 Buddy had just become the proud owner of a new Slayer 12 from Native Watercraft, and was dying to get some slime on it. We arrived at low tide, and started our paddle out of the creek onto the flats. I’m always amazed at the water clarity and how beautiful it is there. We make it out onto the flats, and decide it’s still a bit low, so we make our way out further in search of deeper water. It wasn’t long before we started spotting fish, and these were beautiful spotted sea trout, all in the mid 20″ range. We quickly stopped and started casting. We were both throwing a Savage Gear 3D Manic shrimp under a popping cork with about 24″ of leader. We’d work an area, then paddle and work another area. 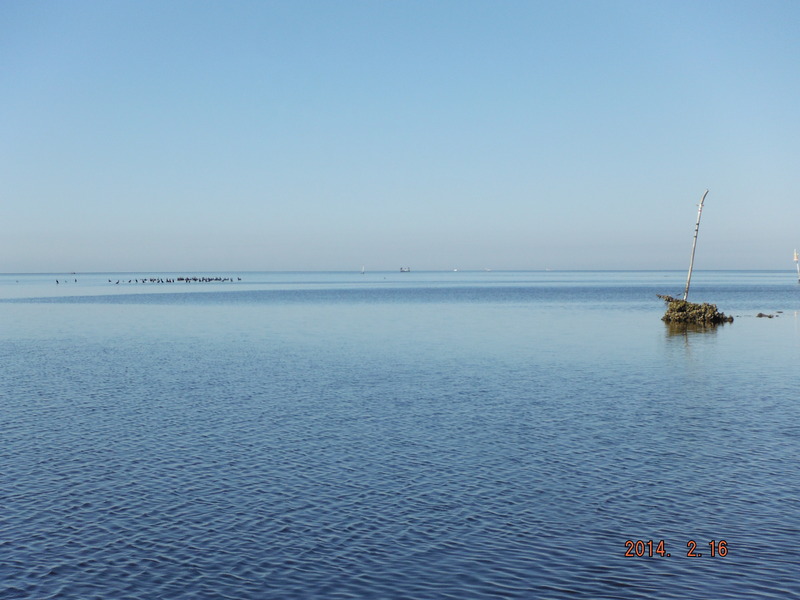 When out on the flats in Steinhatchee, we commonly search for “broken bottom” or “potholes”. These are patches of sand amongst the grass on the flats. Trout will stack up around these “potholes” waiting to ambush unsuspecting bait fish as they swim by. As the morning progressed, so did the winds. What was initially forecasted as winds around 3-5mph was now pushing 15mph, which makes fishing a little tougher on the flats. The flats are wide open and offer no protection from the wind. Normally our plan of attack is paddle out onto the flats, find the patches, then drift over them while working our lures in search of trout. With the winds picking up, drifting become a chore in the SUP, as they have more of a tendency to skim across the water instead of slowly drifting. 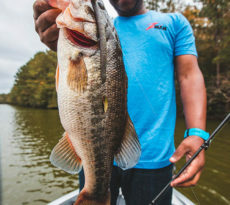 I’d come across an area to work my lure, and start casting from the standing position, but before I knew it, I’d be several hundred yards away from where I initially started! This skimming made casting and working an area a whole new kind of chore, but I kept at it persistently. Buddy and I worked the flats as best we could the remainder of the morning, but to no avail. It’s truly frustrating when you see a few dozen trout in the 24″+ range, as well as several “convicts” (sheepshead), and not get any takers. We started to think that the recent dip in temps and freeze warnings from recently in the week was having more of an effect than we’d initially thought. After drifting our way back towards the entrance of the flats, we started working the more shallow areas of the flats, and I hear Buddy yell, “Fish on!”. 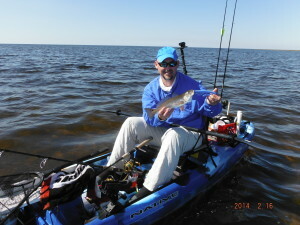 After a tough day of fishing, Buddy got the skunk off and slimed his new Slayer 12 kayak with a nice little redfish. We decided to call it a day soon after, and head in to grab some lunch. While the fishing was tough at best throughout the day, we both walked away pleased with the day’s adventure. Beautiful skies, and crystal clear waters can have that affect on an angler.